For women who want to stay healthy can order Estrace and other medications for women’s health through our Canadian International Pharmacy. We currently have the brand Estrace Vaginal Cream comes from United States manufactured by Actavis, and Estrace tablet comes from Canada manufactured by Acerus Pharmaceuticals. The generic Estradiol Tablet comes from Canada is also known as Lupin-Estradiol manufactured by Lupin. 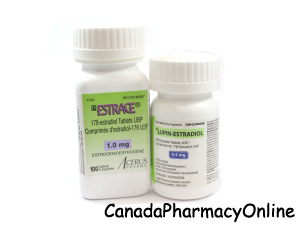 It is available in 0.5 mg, 1 mg and 2 mg.
Estrace (Estradiol) is a female hormone that is used to reduce the symptoms of menopause such as hot flashes and vaginal dryness, burning, and irritation. Estradiol belongs to the class of medications known as estrogen replacement therapy. It is also used to prevent osteoporosis in postmenopausal women and to replace estrogen in women with ovarian failure and the other conditions that cause a lack of natural estrogen in the body. Do not use Estrace if you are allergic to Estradiol or if you have liver disease, a bleeding disorder, unusual vaginal bleeding, and history of a hormone-dependent cancer or if you have ever had a heart attack or a blood clot. Before you start using this medication, talk to your doctor about your medical conditions and about all the medications you are currently taking including OTC medications. Your doctor should check your progress on a regular basis every 3 to 6 months to determine whether you should continue this treatment. Estradiol can harm an unborn baby or cause birth defects. Do not use this medication if you are pregnant. Inform your doctor right away if you become pregnant during treatment. Estrace should not be used to prevent heart disease, stroke, dementia, because this medication may actually increase your risk of developing these conditions. 1. Can I eat grapefruit while using Estrace? Answer: Grapefruit and grapefruit juice may interact with Estradiol and lead to unwanted side effects. 2. When is the best time to use Estrace vaginal cream? Answer: The best time to use Estrace cream is just before going to bed.